With the school year in full swing, I am sure all you moms out there are busy packing lunches for your children. Mine aren't old enough yet for school lunches so I don't do that yet. However, when we go out I always have snacks packed for them so I do some food-related packing! :) My preferred snacks for my children are pretzels, crackers, cheese sticks, peanut butter and jelly sandwiches and fruit snacks. When it comes to packing snacks I only have one packaging option...Ziploc bags. I love these because they are re-usable and seal nicely so my snacks don't end up littering the diaper bag. However, I recently came across a company that also makes re-usable snack bags and these are the "green" option!! How neat is that?!? LunchSkins was created by three moms (Kirsten, Cris and Jennie) back in 2008 and their reasoning was to reduce waste and limit the plastic baggies being thrown into landfills. Seems like a large undertaking, but when their creative juices began flowing, a wonderful idea was formed. While sitting around a kitchen table in 2008, we heard a staggering statistic - every day, more than 20 million sandwich bags from school lunches go into landfills in the US. We knew that many families were looking for easy, convenient ways to be green and avoid this kind of waste. 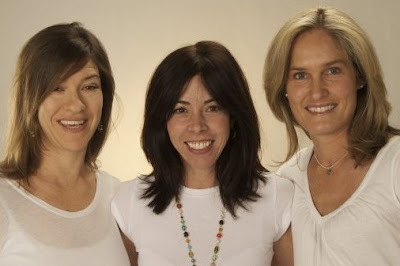 So we put our passion and energy together and 3greenmoms was born. Our mission:to design a colorful, fresh alternative to the plastic baggie. It seemed relatively easy... all we needed was a food-safe, dishwasher-friendly, moderately-attractive reusable bag. How hard could that be? Our number one priority was to find a food-safe fabric, so we went straight to the food industry. There, we found a very high-quality European fabric used by patisseries and bakeries certified as food-safe. Conveniently, this fabric is durable and withstands high heat, too - bingo! It can withstand repeated cycles in the dishwasher. We came up with some fresh, modern designs for those of us who want to dress up our bag lunch. Then, we found a family-owned manufacturer nearby in Wilkes-Barre, Pennsylvania. It all sounds logical, right? But, after many prototypes, sleepless nights, exhausting early morning flights and late evening telephone calls, we think we’re on the right track. Getting here wasn’t easy, but alas, our LunchSkins have put a fresh face on an old idea. It’s been a family affair with husbands, kids and friends sharing advice and support on a daily basis. Whether you care about our environment, saving money, eating healthy, or looking stylish, LunchSkins are the answer to your plastic baggie blues -- they offer an environmental benefit (reduce landfill waste), a practical benefit (they can be used hundreds of times and save you money over the long run), and a healthy choice (food tastes better in a pastry bag). Welcome to our family! For this review I was sent three different LunchSkins to try and they are all sooo great!! I was sent the Green Apple Sandwich Bag, the Orange Bud Sandwich Bag and the Stripe Series Snack Bag. 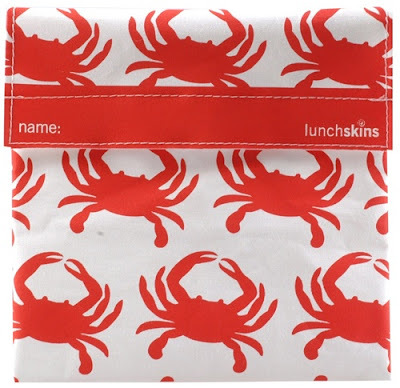 These re-usable snack and lunch bags are very unique in that they are made out of certified food-safe fabric and are also dishwasher safe. They are lead-free, bpa-free and phthalate-free as well. Three different sizes make it convenient for you to pack a complete lunch for your family. There are the snack size bags, the sandwich size bags and the sub size bags. So you definitely have choices! Each bag is Velcro closable and really stays shut well! My daughter carried her pretzel sticks around for quite a while and didn't lose one! 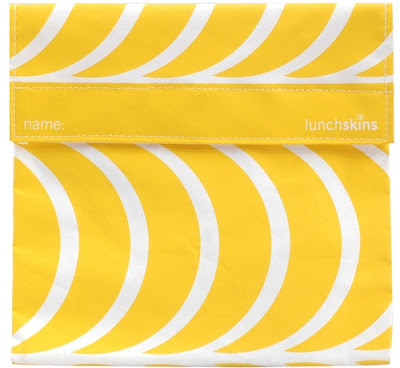 I love the colors and the diverse patterns that these LunchSkins come in...they are very modern looking so your child will NOT have to worry about being "out of style" this year! The other feature that I just LOVE about these LunchSkins is the fact that you can write your name on the outside flap. This really makes things convenient for busy moms who are packing multiple lunches and snacks at a time. There is no confusion at all which is great! LunchSkins are priced depending on the size you want. The snack sizes are $7.85 each, the sandwich sizes are $8.95 and the sub sizes are $10.95. So, if you think the prices are high, just think about the fact that you will NEVER be buying and re-buying plastic baggies again. Think of the money you will save in the long run. I say it is definitely worth it. So, in my opinion...LunchSkins is a wonderful product and company! I love the diverse designs, sizes and styles of these bags. It sure makes packing snacks and lunches an easier endeavor than I am used to!!! I would definitely recommend this company to all of you...especially for all you lunch-packing moms out there...great product for a great value! Visit LunchSkins, then come back here and leave a comment letting me know which design you love. :) You do not have to be a blogger to enter, but you must have a valid email where you can be reached should you win. If you do not leave an email address, it must be where I can easily find it. This giveaway is open to US residents and will end 10/7 at 11:59 pm EST. The winner will be chosen using random.org and will be notified by email. The winner will have 48 hours to respond, or another winner will be selected. 1. "Like" LunchSkins on Facebook. 2 entries, so 2 comments. 2. Follow LunchSkins on Twitter. 2 entries, so 2 comments. Disclaimer: I received no monetary compensation for this post. I did receive free LunchSkins for review purposes. All quotes and stock photos are from the LunchSkins website and email. All thoughts and opinions are 100% mine. I liked Lunchskins on FB! With all these boys in our house, I would definitely pick one of the animal series. My favorite is probably the lizard. I love the animal series - crab! I like their Green Pear Design! I like the animal series-lizard-green. I like the garden series - flower - berry the best! I like the Graphic Series – Vertical - Green.